It’s November 1st and MIXmas is playing on the radio, but we’re still getting over how much fun last night’s Trick or Treating was! 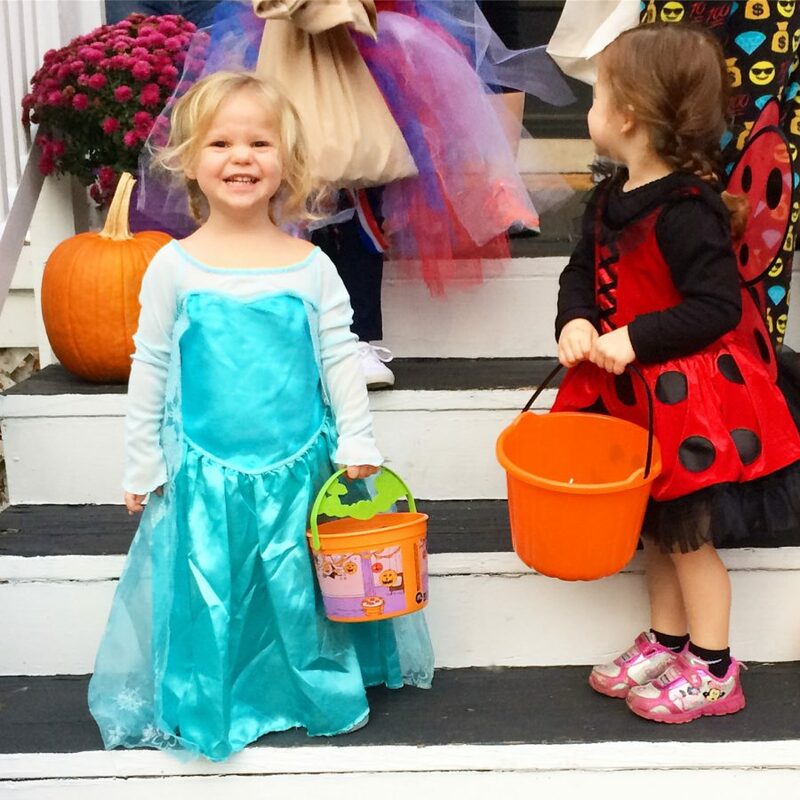 It was the first time for two of our kids to dress up and head out for trick or treating in the neighborhood, and there was a ton of excitement (and way too much candy)! This year, we had an Elsa, a Lady Bug and a Wolverine as well as a Sock Monkey since we went with friends. 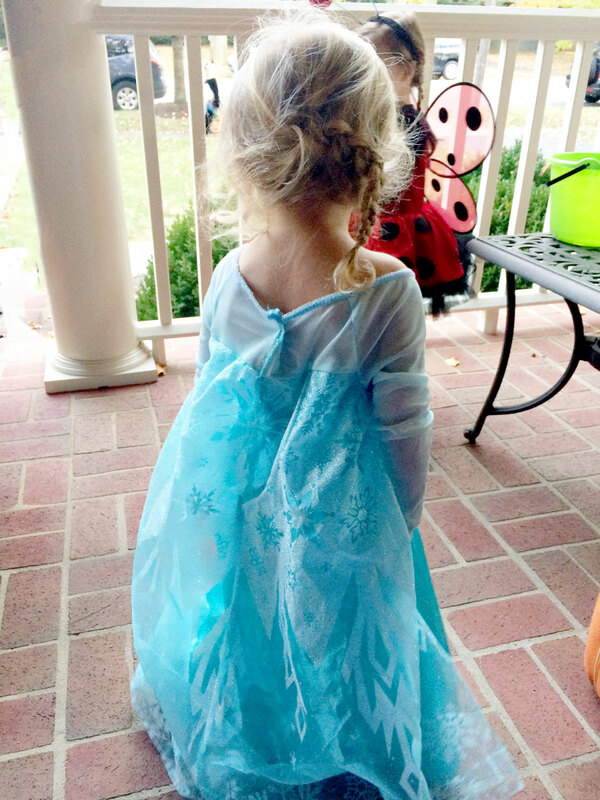 We found Ash’s Elsa costume at Walmart, literally the only long-skirted Elsa costume left and it just happened to be her size! Oh, did we mention it was on clearance? 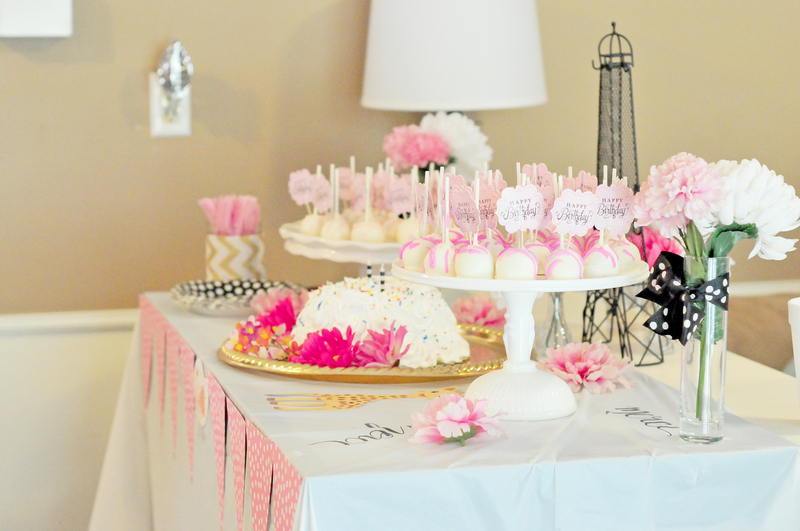 We were completely prepared to have to make a cape and dress ourselves, but this won us over. Jess gave Ashlyn a french side-braid, put on some Frozen house slippers and called it a princess costume complete with glittery cheeks! At one point, there was a snowflake ring and snowflake headband, but those quickly got discarded. 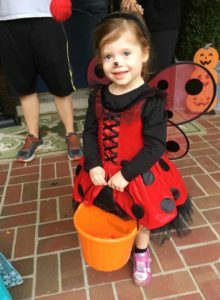 Amanda found the ladybug costume at Marshalls, and it immediately captured her daughter’s heart. Something about tulle & wings wins any little girl over. 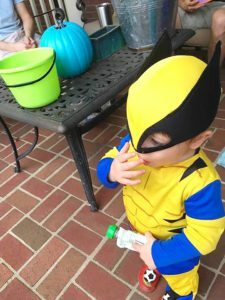 The mini Wolverine costume was a consignment find, but it was new in its package. Brand new costume at consignment price? Yes, thanks! 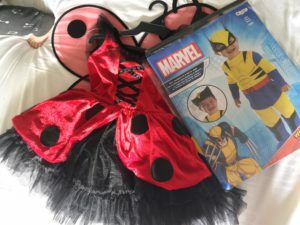 We added a long sleeved black shirt & some black shorts (not visible) under the lady bug costume to ward off any itchiness from the tulle. And even though it was a pretty warm evening for Trick or Treat, the long sleeves helped to ward off any evening chill (does anyone remember going trick or treating in winter coats?? I do!). Alas we had no black boots, so light up mini mouse shoes had to do. A little lady bug dot on the nose finished off our adorable little lady bug. When Wolverine’s costume was purchased, he wasn’t quite coordinated enough to remove the mask. Not so a month or so after. Also, his head must’ve been a bit smaller. It’s pictured here in one of only a few moments that he actually wore the mask. Bless him, it gave him a perpetual pig nose and he was such a good sport to let us get some photos with it on. We’ve already made plans to return to this particular neighborhood next year. 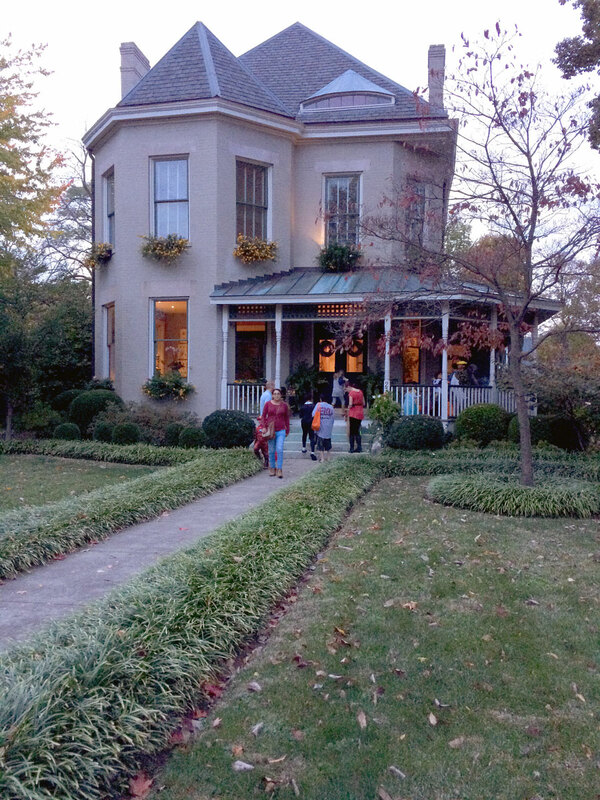 The historic homes were gorgeous, the decorations were so festive, and the streets were lined with little children in costume. We had a blast! With a few lessons learned on “breaking and entering” (people did have their doors open, in the kids’ defense) and taking only moderate amounts of candy at each stop, (people, lets hand out the candy and not let toddlers self serve – we all know they have no concept of self control where candy is concerned! Lol!) 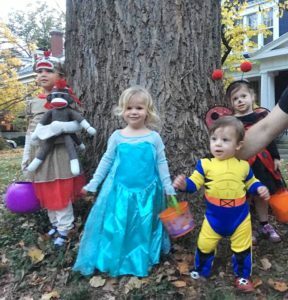 we know that these kiddos are gonna rock their costumes even harder next year! What did you & your littles dress up as for Halloween? We want to see your pictures so tag us on social media! We’re gonna go partake in our “parent tax” candy now. Happy Halloween!